Engineering student’s water filtration system could provide access to clean water for millions of people across Malaysia and the world. Ganesh displays his solar powered water filtration unit. The engineering student at INTI International College Subang has devised a portable solar powered water filtration unit that is capable of providing up to 20,000 litres of clean water at a cost of only 0.025 cents per litre. The modular unit employs a physical filter and UV light to provide water that is safe for consumption. “The unavailability of clean drinking water affects a country in many ways. It damages social and economic development, and could keep the deprived sick, impoverished, uneducated and oppressed. The problem becomes self-perpetuating if we don’t solve it at a smaller and manageable scale,” said Ganesh, who had decided to come up with a solution as part of his final year engineering project. Drawing upon his deep interest in renewable energy and having studied the living conditions of rural folks in Malaysia, Ganesh designed his prototype to be simple to operate, affordable and equipped with safety features as the maintenance of the system would be in the hands of the users. His invention has caught the attention of fellow innovators and he has recently qualified for the finals of the inaugural Global Impact Competition in Malaysia organized by Project Renaissance – an initiative by education company Mindvalley to put Kuala Lumpur on the map as one of the top 10 places in the world to launch a startup – in partnership with Singularity University, an institution that educates, inspires and empowers leaders to apply exponential technologies to address humanity’s challenges. 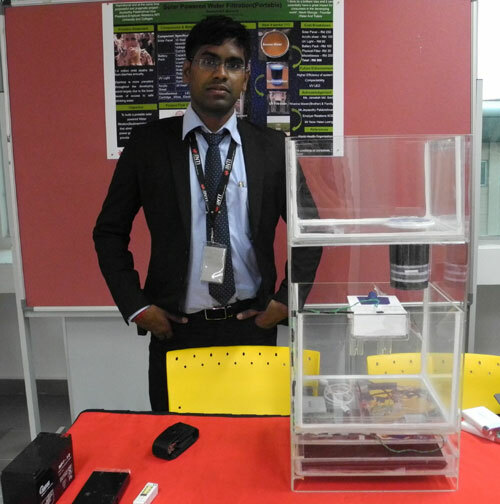 As a finalist, Ganesh has a chance of winning a RM97,000 sponsorship to represent Malaysia at Singularity University in Silicon Valley, where the winner will attend the Graduate Studies Programme from June-August 2014 at the NASA Research Park, and be guided by a faculty of robotics experts, nanotechnologists, biotechnologists, neuroscientists, entrepreneurs, environmental engineers and more. Ganesh exemplifies the self-directed, motivated and independent learners that are nurtured at INTI via an education that empowers them with cutting edge knowledge and abilities. Through an approach that incorporates international exposure, innovative learning and individual development, students develop in-demand skills that include critical thinking, problem solving, collaboration and effective communication. Aside from achieving personal success, students at INTI are inspired to make a real difference in the lives of others through community service, youth leadership and social responsibility. Service to others is emphasized and encouraged, which in turn allows students to develop their potentials as project leaders and productive members of society. By virtue of INTI’s being part of the global Laureate International Universities network, INTI’s students have access to inspiring global events such as the Clinton Global Initiative which convenes global leaders to create and implement innovative solutions to the world’s most pressing challenges, and Clinton Global Initiative University, a forum to educate and motivate young people to make a positive impact in the world. For more information on INTI’s innovation-driven programmes, please call 03-5623 2800 / 06-798 2000 / 03-2052 2888 / 04-631 0138 / 088- 765701.